I am kind of in shock that Memorial Day is just a few days away! We have several friends who have lost loved ones serving in the military, and see Memorial Day as a great opportunity to teach our kids about those brave men and women and the ultimate sacrifice they made. 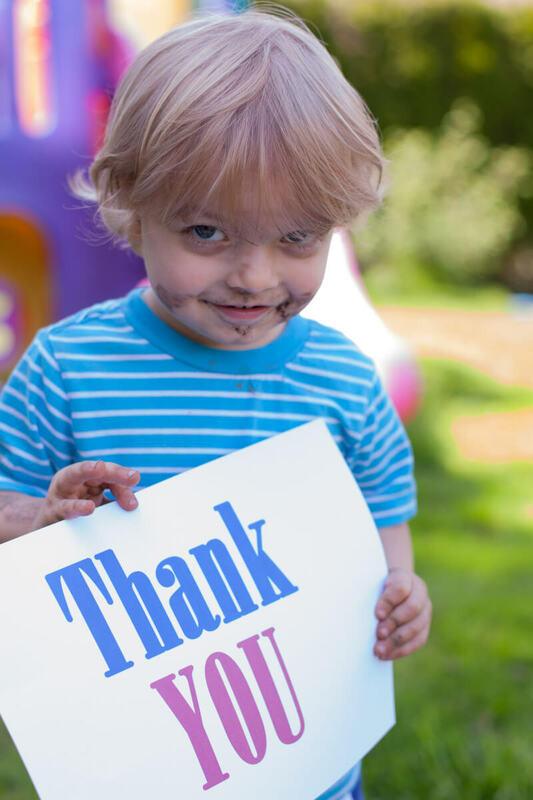 In fact Corban has a little message for those heroes we remember on this important day. What? Your kid doesn’t get this dirty every time they step foot outside the house? Now on the fun side of the Memorial Day holiday, it’s also a great day for grilling, and perfecting some cute red, white, and blue recipes. 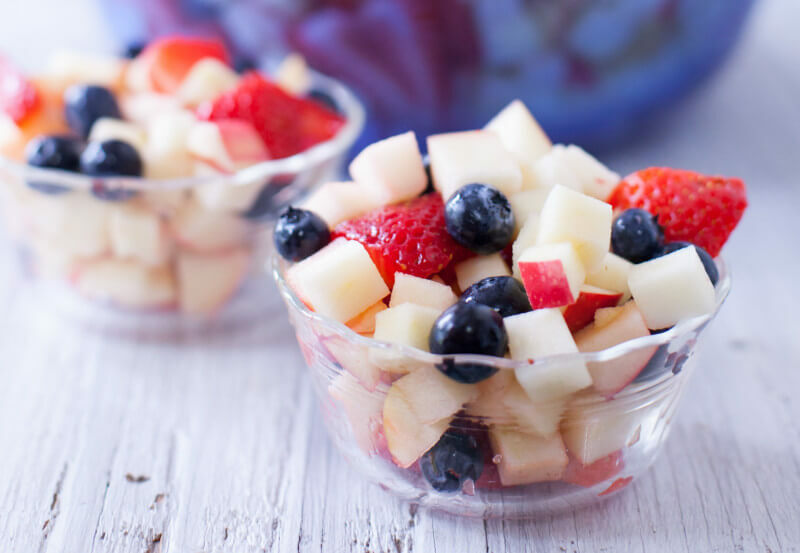 This fruit salad was actually born out of a need for an affordable and easy side dish to feed a crowd. I am one of the two coordinators for the Mops group at my church, and wanted to cook a meal for our leadership team to thank them for serving this year. But I have two kids two and under and pretty much no spare time. So I kept it really simple. A big pot of rice, some honey sesame chicken in the crockpot (expect that recipe next month!) a green salad mix, and some fruit salad. When I make salad for a crowd, I do not want to have to do a ton of chopping. But I also didn’t want to do all berries because they’re expensive. So I met in the middle and did apples (cheap! ), blueberries (no chopping! ), and strawberries (a few slices each). And thus was born the apple, strawberry, blueberry salad. The only other ingredient was a little bit of lemon juice on the apples to prevent browning. You could also pour in pineapple juice to keep the salad fresh if you don’t like the lemon taste on your apples. Then the salad can last up to a week in the fridge, and if the apples do start to brown or the strawberries don’t look as pretty after a few days, it’s great tossed in a blender with a banana for a quick smoothie. 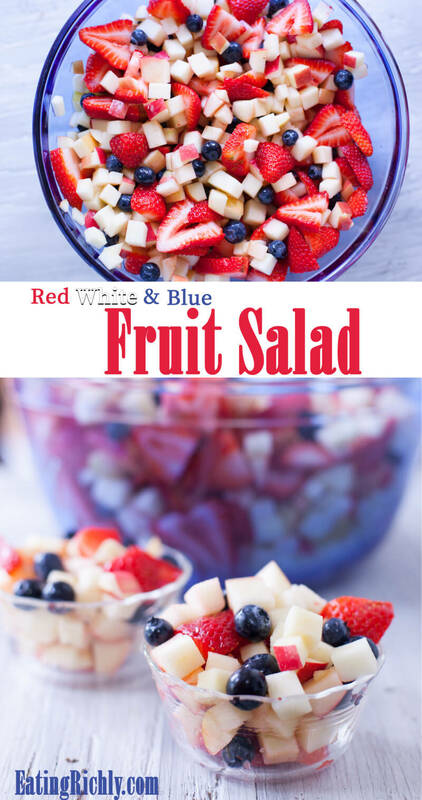 This will also make a nice 4th of July salad since it can be served cold from the fridge, or at room temperature if you’re picnicking somewhere to watch fireworks. Or if you’re crazy brave enough to go sugar free during July like we did a couple years ago, add this to your list of ideas for July Fourth desserts. We’ve been having the leftovers for dessert this week and find it really satisfying. Oh, and I always assume people know to wash your fruits and vegetables, but I know what happens when you assume and we don’t want that…SO…wash them friends! I just keep a spray bottle of 50/50 vinegar and water by the sink that I use, but produce washes are also great. It just helps get all the wax and gunk, and germs from other people’s hands off of your food. Here’s our favorite spray, and it’s super affordable in the 3 pack. Hope you and your family have a wonderful Memorial Day, and our heartfelt thanks and condolences go out to those of you who have lost loved ones in their service to our country. 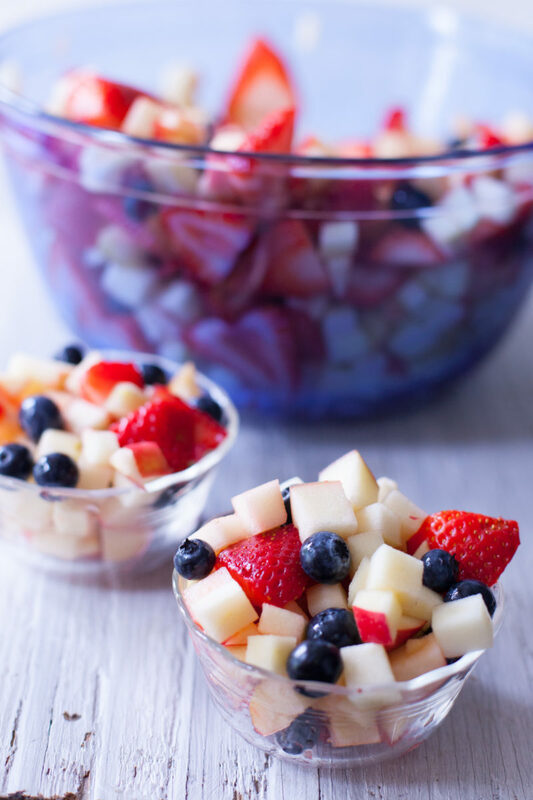 This red white and blue fruit salad recipe is a sweet mix of blueberries, strawberries, and apples. You can use any red skinned apple variety you want, but I really like Pink Lady apples for this recipe because the white flesh of that variety is less prone to browning. You can also easily cut this recipe in half if it's just for your family and not a crowd. Wash all your produce. I use a 50/50 mix of water and vinegar, or you can use a produce wash.
Cut your apples into 1/2 inch chunks. Cut the stem end from the strawberries. I like to do this in a V to give me heart shaped strawberry pieces. Then slice the strawberries about 1/8 inch thick. Toss chopped apples with the lemon juice. Add the blueberries and sliced strawberries and toss again. Approximate cost/serving: We got all our ingredients at Costco and it ended up costing about $9 to make the whole batch, so just 60 cents a serving.